Hard hitting guitar rock with a sometime reggae flavor and intelligent, ironic lyrics. No question Jimmie's Chicken Shack is one of the hardest working bands in the business having toured constantly since 1995. Between headlining their own tours in the US and Europe they've been out with bands such as Live, 311, Creed, Fuel and Everclear. They shared festival stages with nearly every major alternative rock band and many that disappeared without trace. Unstoppable, Jimmie's, or The Shack, as they are known to their fans, just released this eighth album, Fail On Cue, on Fowl Records. The bands first major label single, High, from the 1997 album Pushing the Salmanilla Envelope climbed the charts for twelve months eventually coming to rest in the top 10 of the active rock charts with heavy rotation in MTV’s buzz bin. Do Right, Jimi's ode to an ex-girfriend from the second Rocket album, Bring Your Own Stereo was also crowned, buzz clip, by MTV and again took up residence in the alternative rock charts for a year resulting in yet another top ten hit and ultimately crossing over to top 40 playlists. There have been many changes in personnel over the years and this new lineup is the most powerful yet, drawing from the cream of mid-Atlantic bands. But the absolute has always been Jimi Haha's dynamic stage presence, his exciting, eccentric melodies, riffs and chord changes and his biting, often ironic lyrical take on life. It's all about the music and the performance for Jimmie's Chicken Shack who, despite selling millions of albums on major labels, will never bend to fit. Keep listening to it again and again and everytime the songs reveal new facets. Great album. JCS is one of the best bands to date. I love this album because it's like a roller coaster of sound. Some songs are high energy and make you want to dance, and others make you sit back and think, or maybe even cry. I like the change in energy from song to song, any one of them can fit any mood you could possibly be in. Jimi has a very unique voice, and he's amazing when he sings. If you have ever been a fan of JCS you need to buy this album, you'll love it! I love finding bands that do things differently and mix up their style of music and these guys are great. Not only are the instuments great and up beat the lyrics are massively entertaining. One of my best buys so far!!! Cool lyrics, the most interesting besides The Weakerthans. Gripping tunes. One of the best albums I've bought recently! Respect! nice return to form for the great JCS! 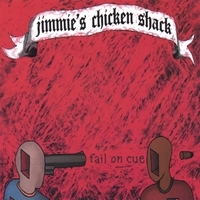 while not quite the classic status as "pushing the salmonella envelope", Fail on Cue is a great record and Jimmie's Chicken Shack are back to creating intelligent music that rocks! This is the first time I've heard JCS. I originally purchased it thinking it was a "blues" album, I was confused. It took me a couple of times playing the CD to get a feel for it but I am now "hooked." Jimmie's chicken shack is the party! Great energy, wonderful twist of creativity and rock energy with a touch of lemon so that you want another shot to keep on rockin! Great music for crusing, partying, or having rock n roll fun. Thimbs up. We're going to dine in at Jimmie's Chicken shack for sure and we'll have the entire chicken please with a side of Rock'n roll fries! Great band great music. Milk then chickens and pluck them cows. THE SHACK IS BACK! Just a really fresh unique sound by the Shack.